Japanese people love raw food. This Tamago Kake Gohan is the good example of it. 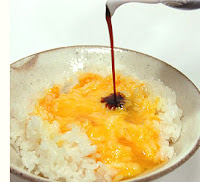 Tamago Kake Gohan, which is sometimes called "Neko manma" meaning food for cat, is very popular in Japan and has been eaten by people since the Meiji era. The recipe for it is very easy. After serving rice on a bowl, pour a beaten egg on it. Then add little soy source and stir them up. That's all. Since I love it, before I ate it almost every day. However, eggs　occasionally have salmonella, so there are a few people who think it is not good for our health, like my mother.